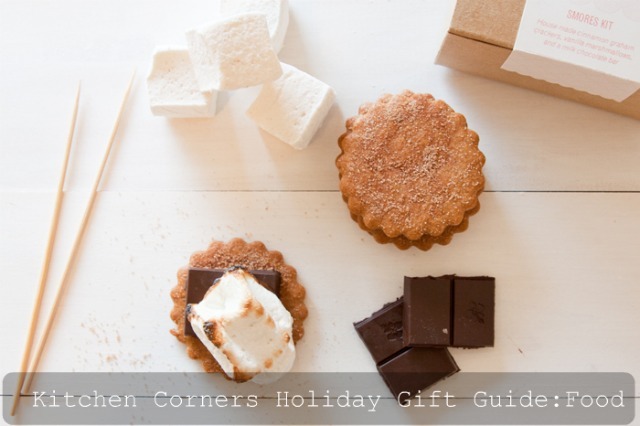 Every Monday from now until Christmas, I'll be posting a quick gift guide to some of my favorite food related finds. This Monday lets talk food. I'm a big fan of giving food for obvious reasons such as the delicious factor, the no clutter factor, and the delicious factor again. Giving food is basically a win. Here are 5 shops I love and products I recommend. Perfect For: Anyone. Maybe not kids because of the skewers and because they would need help assembling it. But definitely teenagers and adults alike. Perfect For: Your friend who eats a gluten free diet. Perfect For: Your aunt who loves canning. Or your hipster friend who knows nothing about canning but likes the idea of canning. Perfect For: Meat lovers, so basically a good 90% of the people you know, also a total dude gift so if you drew you brother-in-law's name for Secret Santa then this would be a totally appropriate gift. Perfect For: The person who gives you love and affection, and do them a favor let them eat it all by themselves. There's nothing worse than getting delicious chocolate and having to share. What about you, do you like giving food as a gift and if so do you have any favorite shops you buy from? Do share.